To understand what a game mechanic is, first it’s important to be familiar with another term important to video games: gameplay. While it can vary depending on who you ask, gameplay is essentially how the player interacts with the game. When you think about a game’s rules, plot, objectives, challenges, and how the player is meant to interact with them, you’re thinking about the gameplay. Game mechanics help provide gameplay by providing a construct of methods or rules designed for the player to interact with. Although various theories are out there concerning game mechanics, they are present in pretty much every video game. A game designer’s main role is to come up with game mechanics that are engaging enough to either entertain a player or give them an impacting and worthwhile experience. 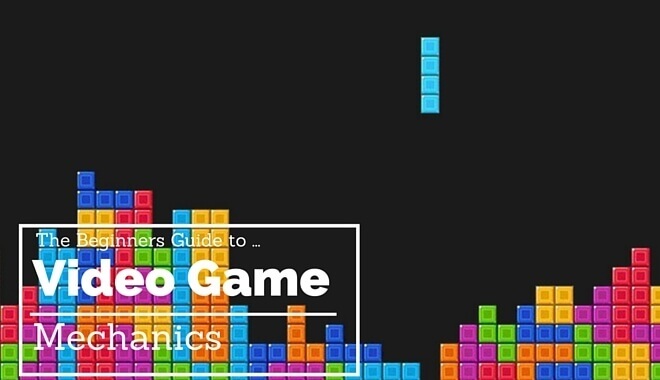 One of the easier ways to understand game mechanics is by looking at a simple game. Let’s use Tetris, one of the most popular and influential puzzle games of all time, as an example. Tetris is perfect because it is not only one of the most successful games of all time, which includes more than 170 million copies sold since its inception, but it’s also a game you’ve probably played before. 1. Rotation system: Where the tetrominoes spawn, in what position they spawn, how they rotate, and their wall kick (their position when you try to rotate on the edge). 2. Randomizers: The order/sequence in which the tetromino types spawn. 3. Scoring Systems: The points you get for line clears, including back-to-back lines, combos, T-spins, etc. 4. Mobility: The player’s ability to manipulate the tetrominoes, including rotating, dropping, etc. While there are plenty of other features in recent versions of Tetris, including new game types with different objects and elements, the four above are the main rules that make Tetris what it is. As you saw from the Tetris example, it’s never really one mechanic that makes a game. Rather, it’s a combination of different game mechanics that determine how the player interacts, the level of complexity, and even how easy or difficult the game is. Game designers are responsible for making sure the different game mechanics work together to provide a satisfying experience that feels balanced. Carelessly tossing a bunch of game mechanics together, no matter how great they sound on paper, will usually result in a difficult and frustrating game. The number of game mechanics involved in a game determine how simple or complex it is. For example, let’s compare an action-adventure game like Middle Earth: Shadow of Mordor with Pokémon Shuffle, a simple match-3 puzzle title. The former is more complex, has a steeper learning curve, and has more depth not because it has 3D visuals, an open world, and countless enemies, animations, and more. The reason Pokémon Shuffle is simpler is because it has less game mechanics. We’ve already mentioned a few of the ways game mechanics are important to a game designer, including their role in coming up with interesting mechanics and making sure they work together to deliver an enjoyable experience. The one thing every game designer wants to avoid is having a list of great ideas on paper that don’t transition well in their video game. When an experienced designer receives overwhelming feedback about their game being too repetitive, they’ll often look back and see what other game mechanics they can add to make the game more interesting. If players say your game is boring or gets old quickly, it might be time to spice up existing game mechanics with better rewards and effects, or by giving them more depth. If you’re an aspiring game designer, one of the best exercises you can do is take any game and try to break it down into main game mechanics. It might be better to start out with simple classic or mobile games and then work your way up to something more complex. The better you get at analyzing and understanding game mechanics, the better you’ll become at coming up with your own awesome ideas.